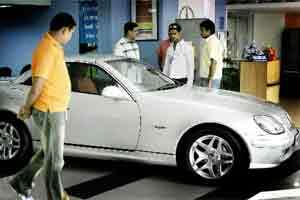 Chennai, Oct 7 (PTI) Luxury car makers Mercedez Benz on Friday said it plans to offer cars to Indian customers on lease basis after the launch of its financial services arm. “We are studying the market. We will be making a formal announcement in the next few weeks," Mercedes Benz India managing director (MD) Peter Honegg told reporters here. This is because the “residual disk" would be borne by the manufacturer while the financial services division offers financial options and the retailer is happy selling the cars, he said. A few months back, Mercedes Benz had formally announced the financial services division in India. Honegg said the concept was well received in developed nations as an individual does not need to own a car but still can use it. “We will be targeting the publicly listed companies once it is launched", he said. On the company’s future plans, he said Mercedes Benz aims to sell over 7,000 units this year compared to 5,600 last year. The company also plans to introduce diesel variants on some of its models owing to the growing demand in India. “40% of our vehicles sold in India are diesel variants. We want to double it. May be 80 to 90% we will bring in some more diesel variants on E350 series and also in some other models", he said. He said they would develop a new strategy to launch diesel variants in India, considering that in the United States (US) and Germany most vehicles sold were Petrol variants. Honegg said the luxury car market in India is roughly around 20,000-25,000 units per month, which is expected to reach 300,000 units in 10 years at a growth rate of 8-10%.